The word “Karate” literally means “Empty Hand”. Fundamentally, it is an unarmed method of self defense. However, Karate consists of many other aspects including physical fitness, sport, mental discipline, and philosophy of life. There are many types of martial arts throughout the world, but everything referred to as “Karate” traces its origin back to the island of Okinawa, Japan. Karate is the ultimate system of unarmed self defense. Karate specializes in strikes such as punching, kicking, chopping, clawing, and gouging techniques. Karate also includes locking, choking, pinning, and throwing techniques which are used in cases where grappling with an opponent is more practical than striking. New students at the Kosho School of Karate learn realistic and practical methods to defend against common attacks such as a punch or kick, grabs such as chokes and headlocks, while advanced students practice against more serious situations such as attacks by an armed assailant. Karate in an excellent form of developing overall body fitness. Stances and kicks develop the legs, punches blocks and strikes work the arms and upper body. Calisthenics and exercises tailored to martial arts training are also incorporated into class. Hitting punching bags and pads also helps with aerobic conditioning and understanding of how to apply the techniques used. Classes at the Kosho School of Karate are physically demanding, but beginners can start at any fitness level. Disciplining the mind and strengthening of the will are important aspects of Karate. The beginning Karate student first learns this discipline at the physical level. He may find it difficult to understand the new movements his body is learning, and his strength and endurance are taxed under the pace set by his instructor. As a student continues in his training, his physical strength and mental attitude towards himself grow. He realizes that, with his new mental confidence towards himself and others, all things are possible. Mastery of mind and body may only be accomplished by a continued discipline such as that found in the art of Karate. He will also find that he is able to apply the lessons learned in karate in his everyday life, allowing him to succeed at whatever he sets his mind to. At first glance, Karate appears to be an extremely violent art. But, in its spirit, it is non-violent. This seeming paradox may be explained by pointing out that while the Karate practitioner trains to inflict utmost violence upon an attacker, he also comes to understand that the only appropriate time to use these techniques is in the most extreme situations such as defending his life, family, or country. He will realize that there is a difference between what is appropriate in a real life situation and what is seen in action movies, professional wrestling, and the bombastic talk and over-the-top threats seen on reality TV. Greater strength of character is often required to walk away from unnecessary fights, or to diffuse the situation without injuring anyone, than to accept the challenge of every street scuffler who wants to “try him out.” This code of conduct does not merely prevent the misuse of the art; it makes an art out of living itself. Through rigorous physical and mental training, Karate can help you develop lifelong friendships with positive like-minded people. Karate is one of the most popular physical activities in the world, and training in the martial arts could lead you to travel to seminars, promotions, and tournaments and even inspire you to learn about new language or culture. Martial artists from around the world share a common bond and approach to life. Because of all the benefits and aspects of training in the martial arts, Karate becomes a way of life for many students. Typical classes consist of a thorough warm up with calisthenics tailored for martial arts training, practicing basic and advanced striking techniques, combinations, and self defense. Depending on the class and instructor, we also work techniques similar to those found in boxing such as hitting the heavy bag, sparring with fellow students (kumite), practice training routines passed down from the masters (kata), and train with weapons(Okinawan Kobudo, bo, tonfa, nunchaku, sai, Jodo, Iaido). Our classes can be physically challenging, as we are training to get in better shape as well as improve our skills as martial artists. However, students at any fitness level are welcome, and you will be surprised how quickly you see improvements in both your conditioning and your physique! Around the year 500 A.D., the Buddhist monk and legendary founder of Asian martial arts, Taishi Daruma, traveled from India to the Shaolin Temple located in Honan, China. There, he found the monks regularly troubled by bandits and also physically and mentally unable to endure the discipline of his teachings. Daruma developed a series of exercises to help the monks condition their bodies and minds. The monks also studied various wild animals and took note of how they used their natural weapons, such as claws, talons, and teeth, along with perfect timing and balance, to attack and defend themselves. From these observations, methods of fighting were developed based on the movements of the dragon, tiger, leopard, snake, crane, and various other animals. Through the centuries these exercises and animal forms were refined and perfected at the Shaolin Temple and eventually spread throughout China. Okinawa is the largest island of the Ryukyu Archipelago that stretches between Southern Japan and Taiwan. Though now a prefecture of Japan, Okinawa was once an independent kingdom. Like all nations, Okinawa had its own native methods armed and unarmed combat. In ancient Okinawa, the unarmed combat was known as “Ti” and involved hard physical training such as punching and kicking wooden posts to toughen the hands and feet, and lifting rocks to strengthen the body. However, the people of the island still needed a way to defend themselves against local thugs, bandits, pirates patrolling shipping routes, and uncivilized tribes from the southern islands that often raided remote villages. Having no access to swords or firearms, the people of Okinawa focused on training to fight using nothing but their hands and feet as weapons. For inspiration, they looked to the Chinese systems of martial arts, originated in the Shaolin Temple by Taishi Daruma, which had been introduced to Okinawa by the Chinese settlers living in Kume. These were combined with the rigorous training methods of the native fighting arts of “Ti”. The result it what we now know as Karate. In extreme situations, the Okinawan people would resort to using various farming implements to defend themselves. Wooden staffs, boat oars, sickles, rice thrashers, mill stone handles, iron truncheons and other items they found on hand. These everyday implements were turned into weapons in the hands of a skilled practitioner and became the origin of the bo, eiku, kama, nunchaku, tonfa, and sai. These martial arts are known as Kobudo, and it is closely related to Karate. Around the year 1900, Tong Gee Hsing began his study of the martial arts in China under his famous uncle, Shang Tsao Hsiang. This study included an eclectic mix of Chinese martial arts, including Xing Yi, Bagua, Hung Gar, and Shaolin Kung Fu. Tong Gee Hsing later moved to Kume, Okinawa where in 1937 he met a karate master from the capital city of Shuri, named Choki Motobu. During this time, many Okinawan martial artists were traveling to mainland China to further their understanding of the martial arts, so it was very exciting for a Chinese martial artist to be so easily accessible and living on their island. Hsing and Motobu trained together, exchanging their knowledge. 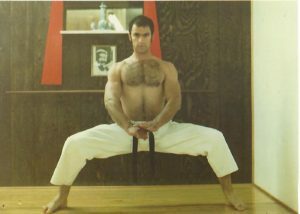 Hsing incorporated many of Motobu’s concepts and techniques into his martial arts repertoire, receiving a black belt and instructor’s certificate. In 1939 Hsing relocated to the Chinese Village on the island of Tulagi, British Solomon Islands. It was here, during World War II, that Hsing met Robert Trias, who was stationed on the island with the United States Navy. 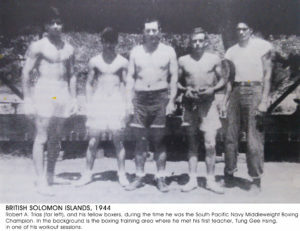 Trias spent his off-duty time training in boxing with other sailors, he was a natural athlete and had been the Middleweight Navy Champion of the All Services Boxing Championships. Hsing convinced Trias to become his student and train with him in Karate and “Chinese Boxing”, making Trias one of the first people not of Asian descent to study these martial arts. Trias quickly progressed and became proficient in Karate, receiving a black belt and teaching certification from Hsing in 1945. 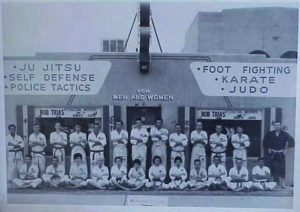 After the war, Trias returned to his home in Phoenix, AZ, and in 1946 opened the first karate school in the United States. In 1948 he established the United States Karate Association, which went on to become the largest martial arts organization in the world. His school and organization became the focus of the development of growth in Karate in the United States for the next 40 years, and his students became recognized as some of the best martial artist in the world. In recognition for his accomplishments, he is often referred to as “Grandmaster” and “Father of Karate in America”. The Karate that Grandmaster Trias taught was founded on a combination of Shuri-Te Karate from Choki Motobu and Chinese martial arts from Tong Gee Hsing, this was originally known as “Shorei Ryu Karate”. Trias was able to remain in correspondence with Hsing until the Chinese communist revolution in 1955. Unfortunately, communication and travel was not as easy in the 1940s as it is today, so he was no longer able to train with Hsing after his return to the US. Since there were no other karate schools in the entire United States, Trias began both correspondence and training with many other prominent martial artists of the era. This included Hoy Yun Ping, Tatsuo Shimabuko, Yasuhiro Konishi, and Makato Gima, among many others. The techniques he learned from these masters were incorporated into his curriculum. Trias trained in Judo with Yushio Yamada, eventually becoming a 6th degree black belt and the US representative for the Kodokan (world headquarters for judo). In the 1950s and 60s American military personnel began returning from their assignments in Okinawa, Japan, and Korea. Some of these men had studied or seen martial arts during their time oversees, and were interested in continuing their training. 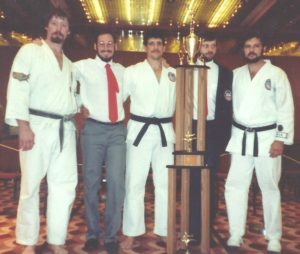 In order to further their knowledge, they sought out Trias’ dojo in Phoeniz, Arizona and his organization, the United States Karate Association. 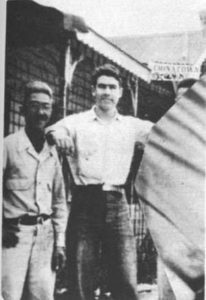 Trias’ dojo was also important stopping off points for Okinawan, Japanese, and other Asian martial artists visiting and living in America. Over the decades, because of this diverse mix of martial artists passing through his dojo and organization, aspects of several other traditional karate styles became incorporated into Trias’ teachings. By 1972, Trias’ organization, the U.S.K.A., had grown to become the largest of its kind in the US (Eventually becoming the largest in the world). However, because of the eclectic way the organization grew, many of the people practicing Trias’ “Shorei Ryu Karate” had widely varying methods and techniques. In order to unify the style, and preserve the highest standards of performance and understanding, Trias created basic performance standards. which were codified in his book The Pinnacle of Karate. 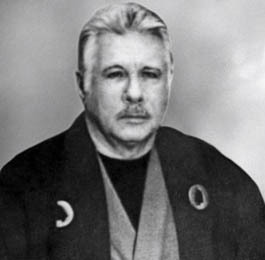 At the suggestion of Makoto Gima and Yasuhiro Konishi, Trias renamed his style “Shuri Ryu”, after the ancient capital of the Okinawan kingdom and the birthplace of Karate. Trias’ students around the world had to take examinations to prove that they had met these stringent qualifications. Those who have, are entitled to wear the style patch on the left sleeve of their uniform.